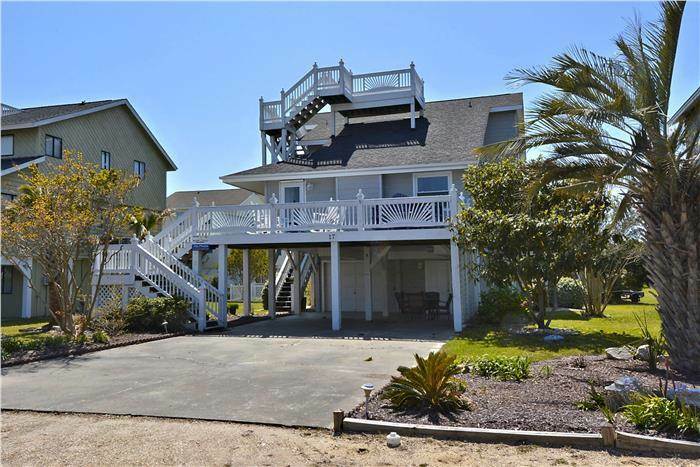 4 Bedroom, 4 Bath perfect beach cottage for those vacationers wanting to feel completely at home during their stay. This property features a cozy living space with a large sectional sofa, flat panel television, and a large dining table. Updated kitchen with granite countertops, custom cabinets and a glass tile backsplash. Front and rear decks and widows walk with views of the ocean and waterway. Sleeps 12. Spacious and oversized bedrooms to accommodate friends and family. The master bedroom has a King and Single Sofa with en-suite bathroom. The second bedroom has a queen bed with a shared hall bath. Upstairs, there is a Queen and Single Bed with an en-suite bathroom. Across the hall find a large bedroom with two queen size beds, en-suite bathroom. An open loft has a TV nook perfect for the kids. Brand new bathrooms updated in 2014 and feature tile floors, new tile showers and vanities to pamper each guest! For your convenience, there is a 2nd refrigerator on the ground level, a pack-n-play, high chair, charcoal grill, a wagon for your beach gear plus several bicycles for exploring the island. This home includes wireless internet access, six cable televisions, DVD and much more. Roof decks, covered carport, hot/cold outside shower, plenty of outdoor seating. Non-Smoking. No pets. We had a wonderful week in this house! Very beautiful and lots of room for everyone! Already booked for next year!